This project shows you how to make your own pillow covers to update or decorate your home. The Easy Print Version contains all instructions and photos. © Copyright 2013 by AOK Corral Craft and Gift Bazaar All rights reserved. These projects are for your personal use only and may not be republished or copied. The Print-out contains all instructions and photos without ads, margins, ads or logos. Bookmark or Share with Friends! Note: If your fabric has a pattern that requires one end to be the top and one end to be the bottom, the length measurement will be the vertical top to bottom measurement and the width will be the horizontal, left to right measurement. Lay out both pieces for the back of the pillow, wrong side up. Lay out the top piece for your pillow, right side up. Please one of the hemmed back pieces onto the top, right sides together and raw outside edges even. Pin all pieces in place. Stitch around the entire pillow cover at ½” from the edge (½” seam allowance). Trim the corners of the seam allowance. 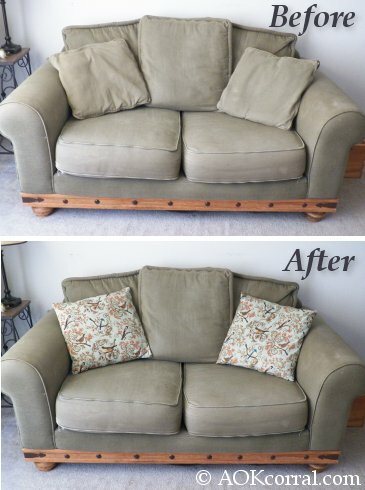 Turn the pillow cover right side out and push out each of the corners. Try the pillow cover on your pillow for fit. See how the back pieces overlap each other and make marks where you want to put buttons, snaps, or Velcro closures. Make a variety of pillow covers for different rooms or even make different pillow covers for a seasonal decorative feel. © Copyright 2013 by AOK Corral Crafts. All rights reserved. The Easy Print Version includes all instructions and photos without margins, ads or logos.